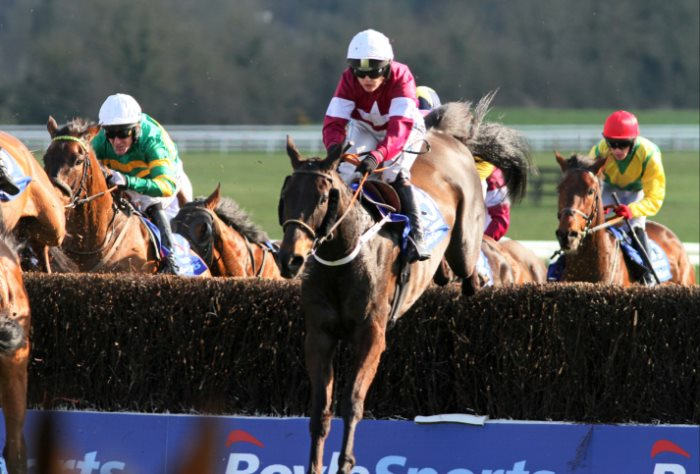 The Irish Grand National is a handicap chase of 3m 5f, held every year on Easter Monday at Fairyhouse Racecourse. It is run right-handed, has 24 fences to be jumped, and finishes with a run-in of around three furlongs, going slightly uphill. It holds the highest classification for Irish handicaps, Grade A, and like its Aintree counterpart has the most prize money of any jumps race in its home country – €500,000 in total, with €270,000 going to winning connections. The race is open to any horse aged five years or older that has a qualifying handicap mark – the official rating allocated to each horse, depending on its perceived ability, with the best horses in the race being given the most weight to carry. The top weight that can be allocated is generally 11 stone 10 pounds, but this can occasionally be increased at the handicapper’s discretion, depending on the horses entered into the race. ONLY EIGHT OF THE 30 RUNNERS FINISHED A THRILLING 2018 IRISH NATIONAL, GENERAL PRINCIPLE (RED CAP) BEATING FOUR OTHERS TO THE LINE BY LESS THAN TWO LENGTHS. The Irish Grand National has been run annually since 1870, meaning the 2020 renewal will be the 150th anniversary of the race. Unlike many races with such a long history, especially jumps races, the race has stayed fairly true to its original format over the decades. However, it was extended from 3m 4f to its current 3m 5f in 1991. There have been several horses to have won both the Irish and English Grand Nationals, the most recent all taking glory at Fairyhouse first, and completing the double at Aintree later on. They are Rhyme ‘n’ Reason (1985, 1988) Bobbyjo (1998, 1999) and Numbersixvalverde (2005, 2006). Much like the Aintree Grand National – at least until Tiger Roll’s second victory in 2019 – the race was notable in only having one multiple winner in its post-war history. Coincidentally, like Red Rum at Aintree, it too was a three-time winning horse – the Jim Dreaper trained Brown Lad (1975, 1976, 1978). The 1970s surely were a golden era for Grand Nationals, as rather strangely, the two winnings streaks overlapped, although their wins never came in the same years (Red Rum having won in 1973, 1974 and 1977). Despite that great feat, the above are still not the greatest horses to have won the Irish Grand National. In 1964, three-time Gold Cup winner, and Timeform’s highest ever rated steeplechaser, Arkle (rated 212) triumphed at Fairyhouse, along with our second-highest ever rated steeplechaser just two years later, Flyingbolt (rated 210). 1990 saw victory for number six in our all-time-greatest chasers list – the famous grey, Desert Orchid (rated 187). There have been many trainers to have won the Irish National multiple times, though none comes close to the great Tom Dreaper. Trainer of both Arkle and Flyingbolt, Dreaper won the race a remarkable ten times overall, seven consecutively, and with ten different horses (1942, 1949, 1954, 1960, 1961, 1962, 1963, 1964, 1965, 1966). The jockey with the best record in the Irish Grand National is Pat Taaffe. He recorded six wins, four of those whilst riding for Tom Dreaper (1954, 1955, 1959, 1961, 1964, 1966). Of those still riding, Ruby Walsh will aim to win his third Irish Grand National should he saddle up on Easter Monday (2000, 2005). Female jockeys also have a very good record in the Irish Grand National, with both Nina Carberry (2011) and Katie Walsh (2015) triumphing in recent years, and the trailblazing Ann Ferris winning on Bentom Boy way back in 1984 – the same year Carberry and Walsh were born! The Irish Grand National is one of the most popular races of the year for Irish punters, and all the big races from Fairyhouse Easter Festival’s are set to be shown on RTÉ in Ireland, and on Racing TV in the UK. As such a popular betting race, there are often some great deals to be found with the bookmakers – particularly those based in Ireland, such as Paddy Power and Boylesports. Deals often include enhanced odds, bet-through-the-card and extra places offers. You can find our top horse racing betting offer below, or head to our Free Bets page for sign-up deals from almost 30 bookmakers. Want to know which horses Timeform’s expert tipsters are backing for the Irish National day? You can get free tips for every race, either on the Timeform website or app, in the form of our tip sheet. Want more in-depth analysis? Look out for Irish Grand National and Fairyhouse Easter Festival previews in our Features section – also available on both the website and the app. 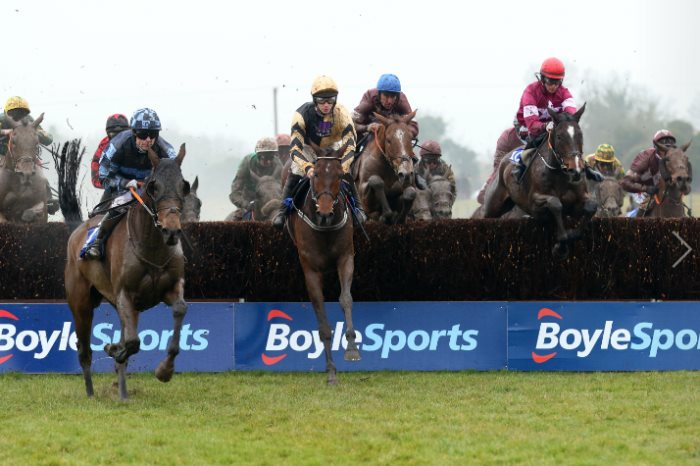 Follow all the build up to the Irish National on the News pages at Timeform. Whether you’re after the latest betting odds, market movers, going updates and non-runners, plus the latest from the stables of the top horses, you’ll find it right here. Simply want to know which horse was first past the post? Then go to our Results page to get the latest Irish Grand National Day Results.